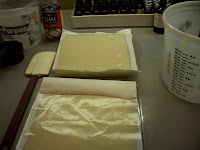 Finally, I am posting about making soap. My first batches of the year. I started out by making a double batch (4lbs) of my Fungus Amungus. 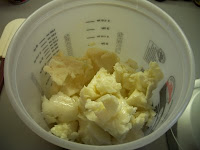 Since I am down to only one bar of soap it was necessary to make at least a double batch. I really should make another double batch, maybe next week. Won't be long and things will be starting to grow and the poison ivy will be out. This soap is AWESOME when it comes to preventing poison ivy and if you don't catch it in time then it is a wonder once you have poison ivy. Wished I was making soap about 4 or 5 years ago. I had poison ivy as well as a reaction to Bradford Pear tree. If you have not seen a Bradford Pear tree the branches have barbs on them. I was out trimming things up and apparently I was poked with the barbs on my arms. The next day I had these brown spots on my arms that I was able to scratch off but the damage was done. By the end of the day I had swollen craters on my arms. MISERABLE!! Never had that happen before and don't want that to happen again. Now I make sure I soap up exposed areas let that sit for a few minutes then rinse and no harm no foul. 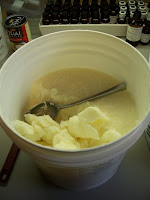 Next I made a double batch of a new soap. I used the same base recipe as my Nutty Coconut. 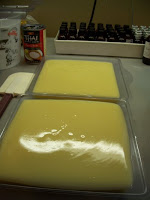 I have been wanting to make more soap with the coconut milk in place of water. I added ground oatmeal as well as Lemongrass, Lemon and Myrtle. I know this is going to be extra lemony, but by February everybody is going to want to smell that invigorating smell of lemon in the shower. It really is a great pick me up. Of course by time I was finishing the coconut soap I realized I promised to take pictures and post them. So I made a double batch of my Fireballs soap. I love this soap. One of my favorite candies is the Atomic Fireball. When I first received a bottle of Cinnamon Leaf essential oil I knew I would love it by itself in a soap. It smells so good when your taking a nice hot shower no matter what time of the day. I hope you enjoy the process. Tomorrow I take it out of the molds. 1. Starting out, I gathered my supplies. Yes I am using plastic. It works for me. 2. Next I poured my water in my container. After that I poured my lye into my water. Yes, I know I am pouring straight into my water. I have tried to weigh my lye in a separate container then pour into the water but I never seem to get all my crystals out. 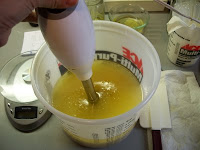 I worry about messing up my lye weight, so I just pour slowly and keep my eye on the scale. I have only messed up twice and over poured. No problem when at home I just get on the computer and change my recipe to fit my lye amount. Always remember to add your lye to water. Never water to lye. It won't be pretty. 3. 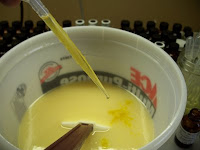 Stir the lye mixture till the crystals are dissolved. Make sure to never breath in the fumes. It will burn your lungs. 4. 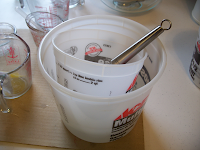 Place the container in another container that has a couple inches of water in it. 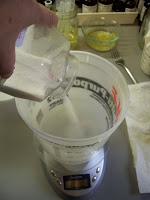 If using coconut milk or any other milk it is helpful to have a small cup of ice in the water. The sugars super heat with the lye. Since I am using thick plastic and not glass I don't want to melt my container. 4. This is my container of coconut oil. 5. Here are all of my oils measured out and ready to melt. 6. I love my microwave. With a double batch I start at 2 minutes. Because my most of my oils started out solid it takes longer. After the first 2 minutes give it a little swirl to even up the temperature a little then give it another minute. 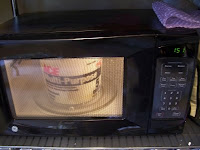 If you get it too hot it will pop in the microwave so it pays to go slow. If there are a few blobs left to melt go ahead and take it out. You can stir those out. 7. You may have noticed that I never showed you a thermometer. I have learned what 110 degrees feels like. It doesn't have to be exact. Summer you can go to 100 degrees, but in the winter you want to go higher. I have read that some even do 120 degrees. 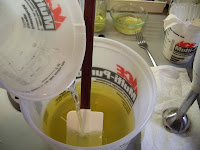 This step I am pouring my lye water into my oils. 8. Now that everything is together I start out getting it mixed up well. 9. 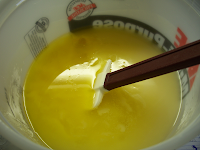 Now I mix with my immersion blender. This is another tool I love. 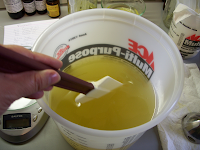 My first experience with soap making was stirring by hand. We stirred for 3 hours. That is what the person said to do at the class my mom and sister went to. Three hours of three people keeping the spatula moving quickly. That was a long 3 hours and to top it off we made a second batch that day. Each batch was 6 lbs each, but still! Immersion blender less then 2 minutes. Much better. Worth the $2.00 I paid at a yardsale. 10. After mixing things have turned lighter. When you mix this up you want to reach sapponification. 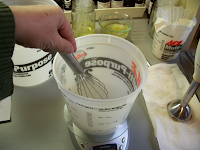 You don't want to see oil streaks in your mixture. Let it sit a minute or so and if you don't see oil rise or streaked then you have reached sapponification. 11. Once you have sapponification you should have trace. 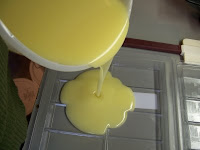 Trace is when you drizzle over the top of the soap and if the shape holds for a short time then you have trace. Some soapers think you have to have it at a pudding constancy, but that is not true. A lot of times it can be very thin. If I am adding in something in like oatmeal, coffee grounds etc. I do like it to be thicker so that they do not settle at the bottom. When I put something in I want it to go all the way through the bar. 12. 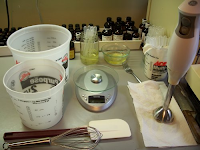 After you reach trace this is when you want to add some of your oils, essential oils or other additives. There are some oils that do better after trace. 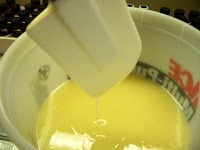 Sunflower oil is one of my favorites and it prefers after trace. Stir this together well. No Oil Streaks! 13. Time to scent. I am putting in 15ml of Cinnamon Leaf. I love this stuff. 15. Time to pour in the molds. 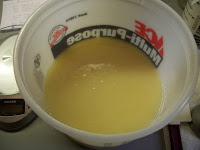 Since I am using plastic I do grease it with petroleum jelly. You can not use regular oil. It will turn into soap. Of course you can't coat it too thin or too thick. Too thick and it will be sticky and will not get it off till you take a shower. 16. Soap in the molds. 17. Once poured into the molds cover it with butcher paper. I put the non-shiny side down. This helps prevent soda ash from forming on the soap. This isn't a problem so much. It rinses off. Just an aesthetic issue. 18. Time to put the soap to rest. 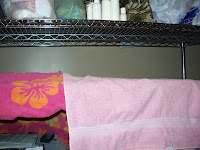 You want to cover it up with towels or a blanket. Wouldn't want your soap to catch a cold. You want the temperature to come down slow. using the plastic molds you should be able to take it out of the mold within 24 hours. When you use citrus essential oils it will take longer. Nice description and good photos. Well done.